When I was a boy, up until I was about age thirteen, I was, in a phrase often used by members of my parent's generation, "a pistol." But by the time I turned thirteen, a change had come. I was obedient to my parents. I wasn’t perfect by any means. And I’m still not. But when I hit my teens, my parents weren’t always wondering whether they could trade me in for a new model. The reason for this transformation, I think, was simple: I feared my father. I don’t mean that I was afraid of how he might punish me. I was afraid of hurting him, of angering him, and of disappointing him because I knew how much he loved me. My fear was born of my gratitude to my father. My dad and I didn’t always see eye to eye and we still don’t and he was far from perfect, but I always knew that, at least in relationship with the world outside our doors, he had my back. So that later, when at age 18, I went to work in the factory where he was a time study man, I tried to work hard and reflect well on dad. I grieve for those people who grew up without knowing that at least one of their parents always had their backs. I grieve because it’s a hard and hurtful way to be introduced to the world. And I grieve too, because it’s hard for a person to trust the One we Christians call “our Father in heaven,” when the only father they’ve ever had was so untrustworthy. Now I’ve spent time painting this picture of my father because, I hope, it will help us all understand what the apostle Peter is getting at in today’s lesson. Peter wrote this letter to churches in Asia Minor, a region of the world which today is basically Turkey. There’s some dispute among scholars as to the nature of the experiences which the Christians to whom Peter wrote were then undergoing. Some scholars say the Asia Minor Christians were suffering outright government persecution and the threat of death. Others insist that they were people--like Jews who had come to faith in Christ--who were undergoing pressure from their families and friends to renounce Christ. Whatever opposition the Christians in Asia Minor were suffering--persecution, pressure from loved ones and friends, or the simple allure of conforming to their own desires rather than the will of God, Peter wanted to remind them of the faithfulness of the Father Who had sent His Son Jesus to die for them and their sins, then rose for them to open up forgiven, eternal life to those who trust in Christ. And he also wanted them to see that trust in God is lived out each day in the decisions we make, the actions we take, and the things we’d like to do, but refuse to do or that, in moments of disconnectedness from God, we may do, for which we repent. Peter’s encouragement to a group of first century Christians is something you and I need today. 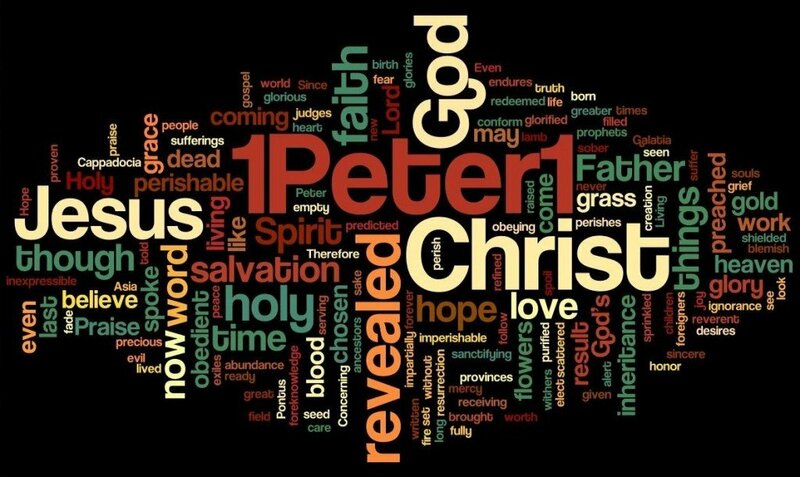 So, please go to our second lesson for today, 1 Peter 1:17-25 (page 850 in the sanctuary Bibles). It begins: “Since you call on a Father who judges each person’s work impartially, live out your time as foreigners here in reverent fear.” This verse really is the whole ballgame in understanding today's lesson. So, we'll spend some time unpacking it. First, Peter calls God the Father. Now, God is called Father in only a few places in the Old Testament, although in the years before Jesus was born, some Jews had taken to referring to God in this way. But when Jesus came along, He not only called God Father, He did so by using the most intimate term for Father in Aramaic, the language he used every day. He called the Father Abba, basically meaning daddy. Even more stunningly, in the Lord’s Prayer, Jesus told all who believe in Him, to think of God the Father as their dad. He’s the Dad Who’s got His children’s backs. Through Jesus, we know that our heavenly Father really is with us always! Good dads and good moms, no matter how much they love us, are only a fraction as loving as our heavenly Father. Second, in this one verse, Peter tells us that our Father will also judge each person’s work impartially. Lutherans, your ears should perk up when you hear phrases like this. You may be thinking, we're saved by grace, not by our works. But let’s be clear, Peter is not saying that we are saved by our works. The word Peter uses which is translated as work in our Bibles has the idea of the whole content, the whole flow of our life’s works and motives, not a single work or set of works. Every one of us sins every day. God knows our imperfections. He understands that we never get this Christian thing completely right. That's why God, our compassionate Father, judges those who trust in Christ, however imperfectly, by the intentions of our hearts. He judges us by that in which we repose our ultimate hope. Christians know not to place their trust in themselves, or their money, or their accomplishments, or their religiosity, but in Jesus Christ alone. When they do that...when we do that...it changes how we live our lives, it prompts us to lives and service rendered in Christ’s Name, no matter what pressures or temptations we may face. Our work in this life is not to negotiate a set of religious requirements, but to trust in Christ, to follow Him always, and, whenever we lose our ways, to follow Him again. When we do that, God will show us the way. Jesus was once asked: “What must we do to do the works God requires?" In John 6:29, Jesus answers: "The work of God is this: to believe in the one he has sent." Trust the One Who has offered you eternity and peace with God through Me, Jesus is saying, and He will so infect your life with gratitude and holy fear, you will live this life and eternity differently. Trust the Father and keeping trusting the Father you know through Jesus and His love will change how you live, often without your even knowing it. And the third major point I draw from this one verse in today's second lesson is this: We’re to live our lives as followers of Christ, knowing that we are foreigners to this world. As we mentioned last Sunday, through our faith in Christ, we’ve been made new. We’re not a part of this dying world. When the things of this world die, they die. When we who trust in Christ die, we rise. Peter wants to remind us not to get too comfortable with this world...and not to pay too much attention to what a dying world thinks is important. Through Jesus, you and I know God the Father. We know how much He loves us. We know that we can trust Him. And because of that love, we can have intimacy with God. We know that God has our backs. Some people read those words and are disturbed. They think it means that God is cruel and capricious, that we have to try to please Him to prevent Him from sending us to fiery hell without access to air conditioning. But this is what we know through Jesus: God isn’t out to get you. He hates your sin. He hates my sin. But He loves you and He loves me. He sent Jesus to rescue us from ourselves and from the eternal condemnation we deserve. That rescue comes to us when we trust in Christ as our God and our only Savior. To fear God is to be filled with gratitude for His love and grace, to fear nothing so much as hurting the feelings of the One Who has loved and still loves you and me more than any person we’ve ever known. Through your faith in Christ, God has become your Father.